Front Cover - David Scott of the Savannah River Ecology Laboratory (SREL) provided this year’s cover photo. The photo was taken in the Mixed Swamp Forest Set-Aside, which is part of the Savannah River swamp. This Set-Aside is one of the original ten SREL habitat reserve areas selected in 1968 to represent a diversity of bottomland hardwood/floodplain forest communities of a southern river swamp system. Represented are aquatic, semi-aquatic, and terrestrial habitats associated with cypress-tupelo ponds, mixed hardwood sloughs, and mixed hardwood ridges. 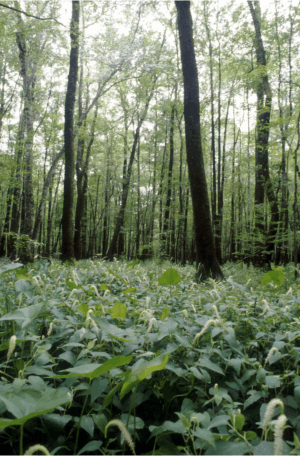 This Set-Aside is important because seasonally flooded hardwood forests are becoming increasingly rare habitats that are particularly vulnerable to habitat destruction and/or alteration due to drainage, water control projects, industrial or urban waste discharge, or power plant cooling effluents. The flower in the foreground is called Lizard’s Tail (Latin name Saururus cernuus). It grows in a variety of aquatic habitats, but on SRS it can be particularly abundant in some of the swamp forests.